My name is Jessica Richter. I am 21, from Cork. I study Corporate Law with German at the National University of Ireland, Galway, and I am a member of the Washington Ireland Program Class of 2016. Being awarded an All-Ireland Scholarship changed everything for me. It has enabled opportunities that have shaped my life and the lives of those around me. It has instilled a sense of obligation, to pay forward the good deeds that the world has bestowed onto me. I don’t think I will ever be able to truly express my gratitude to JP McManus, his family and the Board of Trustees for the possibilities that they have created for the hundreds of scholarship recipients just like you and me. 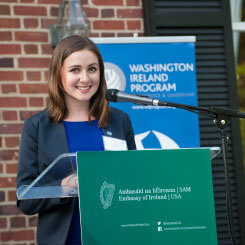 The first time I heard about the Washington Ireland Program for Service and Leadership (WIP) was at the All-Ireland Scholarship Awards Ceremony. I remember briefly considering it, and then writing it off as being ‘not for me’; the shores of Galway seemed challenging enough for a Corkonian like myself. However, as I began University life, WIP seemed to crop up in every aspect of what I was passionate about; University societies, Students’ Union activities, and various domestic and international volunteering organisations. WIP brings together engaged students from all over the island of Ireland, and inspires them through their differences during an intensive two-month term in Washington D.C. My internship was at the Centre for Democracy and Technology; and through various WIP-led events I was able to combine my passion for technology and international development, to begin my career. The power of collaboration within a group of 30 young people with diverse backgrounds is mighty. You find yourself soaring through the summer, and being sustained by the omnipresent aura of possibility. To be accepted onto the program, you need to demonstrate that you are active in your community in serving others, and that you have the potential to be a real leader, in making the world a better place. It has utterly nothing to do with your grades or what you study. Once you consider applying for WIP, you owe it to yourself to give it your best shot. Alumni are always glad to help a prospective WIP-per with their application. The curriculum is designed in a way that allows each student to achieve the most from the summer. Once accepted, you belong to the most diverse network of leaders on the island of Ireland. It is a sense of belonging that is not replicated anywhere else, and the possibilities are endless.